It’s an incredibly exciting time for ecommerce business owners. The world today is, for all intents and purposes, a digital one. News, entertainment, shopping, and so much more are now but a keystroke, mouse click, or finger swipe away. In fact, you can even just talk to your smartphone or smart home device and it will find exactly what you are looking for in a matter of seconds. The internet is the be all and end all of information. You can use it to find pretty much anything, from directions to the nearest restaurant to that perfect gift for that very special someone in your life. What does this all mean for us online merchants, though? Well, more so than ever before, we must be there at every possible turn to capture and entice our consumer base. Collectively, marketers and advertisers commonly refer to that very effort as omnichannel marketing. Omnichannel marketing is the practice by which online businesses, such as ecommerce stores, find and attract consumers by leveraging every available network at their disposal. However, our focus throughout our time together will be on only one of these: Search Engines. Primarily, we’re talking about paid search advertising through the largest and most powerful search network in the world: Google. So, before delving deep into our primary topic, Google Shopping, I wanted to first go over the broad category that it falls under. Paid Search Advertising, also known as PPC or Pay-Per-Click, refers to the use of popular search engine marketing platforms such as Google Ads (formerly AdWords) to build, manage, and optimize advertising campaigns to attract potential customers to one’s online business. In Google Ads, for example, advertisers set up campaigns and expense a set budget to allow ads to appear when someone searches online. Advertisers literally bid on keywords or products so that their ads can appear more often when a search query closely matches their ad targeting criteria. Additionally, advertisers configure campaigns based on unique targeting criteria such as location, demographics, and devices. Bidding, as it is referred to, typically follows a CPC or Cost-Per-Click model where a cost is placed on a given keyword or product which is the maximum amount an advertiser is willing to pay for a click. The higher an advertiser sets their Max CPC the better chance of their ad being triggered. Platforms like Google then charge the advertiser only when someone clicks on one of their ads. Max CPCs, in general, vary from industry to industry with some businesses like mortgage firms and law offices paying $50.00 or more for a single click on one of their ads. While I may be a little biased in my expert opinion, one thing I can say for certain is that most marketers would rank Paid Search Advertising in their top 3 for most valuable when it comes to omnichannel marketing initiatives. To that end, Google is at the forefront of paid search due to its dominance over the search market share both domestic and worldwide. As of July of 2018, statistics and studies portal Statista reported that, in the United States alone, Google controlled over 63% of all online searches. That is the real the question, isn’t it; why? Why paid search? Why is it so valuable and why should it be part of your overall ecommerce marketing plan? We’ve just covered one major reason in reach. The sheer size of the pool of potential shoppers out there is borderline astronomical. Remember that we are not just talking about people at home surfing the web. Consumers are starting and even ending their purchase behavior at every possible point in the journey for what they want most. Whether you wish to reach a broad or finite audience, platforms such as Google Ads provide incredibly powerful targeting capabilities to the advertiser. This makes for one of the most crucial aspects of advertising on search engines. Targeting greatly improves your chances of reaching the right type of consumer, at the right time, and for all the right reasons. Opposite, but just as important to that, is the ability to exclude and stop your ads from being displayed to low-value or irrelevant targets. While targeting itself could be considered a form of control, there are other factors beyond targeting that set control on its own, especially in Google Ads. Advertising campaigns in Google are fully controllable in both form and function. You can control not only how you advertise your product(s) and what products you advertise, but also, and very importantly so, how much you spend on your advertising. Cost-control is what gives rise to the potential for both profitability and loss. This is what truly sets paid search apart from traditional advertising mediums such as TV or print media. Google Ads especially is outfitted with some of the most robust analytics and reporting tools in the PPC world. It is how you can be sure of your performance. It is also the only way you can make decisions regarding strategic implementations to improve your ad campaigns. Couple those native analytics tools with supplemental sources, such as with Google Analytics, and what you have is nothing short of a powerhouse feature set. By leveraging paid search advertising and following best practices, merchants today can generate a substantial amount of incredibly targeted traffic with high purchase intent and at a profitable cost-per-acquisition. After all, that is the lifeblood of an ecommerce business. A steady stream of eager shoppers who want what you are selling, and now you have a way to get them to your store. Chapter 1: What is Google Shopping? Now that you’ve gotten a feel for the broader category of paid search advertising we’re going to dive right into the focus of our journey: Google Shopping. So, what is Google Shopping? An advertising campaign type within Google Ads (formerly AdWords), Google Shopping is exclusive to merchants who sell tangible or even media or downloadable products online. By creating and managing campaigns that follow the pay-per-click or PPC model common in both search engine and social media marketing, merchants can leverage Google Shopping to drive highly targeted traffic to their storefront. This traffic is often more cost-effective and has a higher probability of converting into a sale than more traditional ad types like text ads. Additionally, Google Shopping ads do not run off keywords and instead utilize your actual product data from your store to power their ability to appear when shoppers search on Google. Instead of bidding on keywords, merchants and advertisers bid on the products themselves to increase their potential to show when someone uses similar or matching search queries. For example, if you were to search for “nike running shoes” in Google, product ads that match or closely match that query based on such things as the key terms found within product titles and descriptions. Google Shopping has gone under a few iterations as time has passed. Originally a free-to-play model (and after having a few early names including Google Product Base and Froogle) it is now widely considered to be one of the most powerful marketing channels for ecommerce merchants. What do Google Shopping Ads look like? For its appearance in general search, they include specific details such as product image, price, product title, merchant name, and sometimes promotional messaging. Shopping ad appearance is a bit different on both the Images and dedicated Shopping tab. In image search, they typically include only image, price, and merchant name. The Shopping tab is a bit more robust, however, and acts much more as a comparison-shopping tool where shoppers can view more details on products, filter their results, and even do some price comparisons between the various merchants that are selling the very same product. Only built using the new version of Google Ads, Showcase Shopping Ads are a relatively new format in Google and are only available in Australia, Canada, Germany, France, Hong Kong, Ireland, India, Indonesia, Malaysia, New Zealand, the Philippines, Singapore, South Africa, Taiwan, United Arab Emirates, the U.K., and the U.S.
Showcase ads are unique in that they are triggered only for broader search terms such as when someone simply searches “summer dresses” without specifying other qualities like brand, color, etc. Visibly is very different than standard Shopping ads on Google, they display relevant products together in a single unit with a user-set image representative of the products contained. The shopper can then click on a unique product to be taken to your store to purchase. For more detailed information, visit the Google Ads help center. Over time, Google launched several special programs for merchants and advertisers. Some of these programs, which have been around for quite a while such as Product Ratings or Merchant Promotions, supplement your Google Shopping efforts directly. Shopping Actions is a program for merchants who would like to sell their products on Google’s very own online marketplace Google Express. Some of the biggest names in retail, such as Walmart and Costco, have made Shopping Actions part of their digital strategy. To be able to participate in Shopping Actions, merchants must first fill out an interest form. Additionally, inclusion in Shopping Actions comes with its own unique set of requirements and guidelines. In response to the European Commission’s massive fine for allegedly monopolizing shopping comparison search, Google has been forced to completely alter how Google Shopping works in European countries including Austria, Belgium, Czech Republic, Denmark, Germany, France, Italy, Ireland, the Netherlands, Norway, Poland, Portugal, Spain, Sweden, Switzerland, and the U.K.
Now, Google must give up half of its Shopping ad positions to what are known as CSS or Comparison Shopping Services. Google developed a special program called Comparison Shopping Partners. By advertising with vetted, certified Google Partners, merchants who target EU countries or sell in the EU can gain access to these new, dedicated ad positions. Since these ads are technically entered in a separate auction than that of traditional Shopping ads, they have shown to have a relatively lower average cost-per-click and higher ROAS potential. Feel free to visit our site to learn more about this program and our Certified Comparison Shopping Service PriceJoy®. I cannot stress how important it is that merchants educate themselves on the basics of Google Ads and Google Shopping policies. Google has relatively strict guidelines for all advertisers, regardless of business type. However, online merchants have a few extra guidelines they must adhere to. Every merchant should begin by getting acclimated with these policies set forth by Google. So, before continuing, I recommend that you review and understand both the Merchant Center Guidelines and Shopping Ads Policies. Also note that Shopping Ads are currently only available in Argentina, Australia, Austria, Belgium, Brazil, Canada, Chile, Colombia, Czechia, Denmark, France, Germany, Hong Kong, India, Indonesia, Ireland, Israel, Italy, Japan, Malaysia, Mexico, New Zealand, Norway, the Philippines, Poland, Portugal, the Netherlands, Russia, Saudi, Arabia, Singapore, South Africa, South Korea, Spain, Sweden, Switzerland, Taiwan, Thailand, Turkey, United Arab Emirates, Ukraine, the U.K., the U.S., and Vietnam. Three Google platforms work in tandem to allow you the best experience with Google Shopping. I suggest getting these set up and configured before moving onto the next set of requirements because getting each account squared away is relatively quick and painless. Google Ads: Where campaigns are created and managed. Also includes robust analytics and reporting capabilities. When creating Shopping campaigns in Google Ads, there are several unique approaches you can take to structure and management. Merchant Center: Where your product data is sent and stored. Also includes diagnostics and reporting. Product data is used to fuel product ads on Google Shopping and all merchants are required to submit their product data in a format known as a Product Feed. Google Analytics: As the name suggests, this is where you can gather and review vital performance stats for not only your website but also your advertising campaigns. Fun fact: While technically not “required”, Google Analytics is so highly recommended that it should be considered a requirement. You must also link your Google accounts together properly. Google Ads connects to both Analytics and Merchant Center. The connection between Google Ads and Analytics allows performance data to flow between the two and is also essential for conversion tracking. Linking Merchant Center with Google Ads allows your product data to be shared which is the basis for your Google Shopping campaigns anyway. Some product ad performance data is also passed from Google Ads back to Merchant Center. As I said previously, all merchants are required to submit their product data to Google to be able to take advantage of Google Shopping as a search marketing effort. Since your product data is already stored on your website (or technically in your store’s control panel), the only thing left to do is to get that data out to Google. That data is sent to Google in a format known as a Product Feed. That’s where Google Merchant Center comes into play. Feeds can be submitted to Google in varying formats including in a file such as an XML or TXT document, via Google Sheets, or via Google’s Content API. Product feeds themselves follow a standard set of guidelines (yes, more guidelines, I’m sorry) issued by Google known as the Product Feed Specifications. By following these guidelines, merchants can better ensure that their feeds are accepted by Google. Once a feed has been uploaded to Merchant Center it is processed and Merchant Center will provide diagnostics on both the quality as well as any issues within the feed such as missing required data or data that was submitted but is either invalid or does not meet Google’s requirements. Products can be either Approved or Disapproved based on the information you submit to Google. Google can even suspend your Merchant Center account if your products, feed, or even website violate any of the policies. A status of Approved indicates that a product is eligible to be used in your Shopping campaigns while a Disapproved product is not eligible and therefore will need to be adjusted to get it approved. If this is your first time ever sending a feed to Google, it can take 24 – 72 hours for Google to fully process your feed. During this time Merchant Center is essentially scanning both your feed and your website to ensure both meet their advertising standards. This is referred to as Pending status. After initially setting up your Merchant Center account, you may want to get ahead of things by configuring your Shipping and Tax settings. This can save you sometime later when you are ready to send your feed. While there are attributes allowed in a feed for both, it is much easier and far quicker to configure them at the account level in Merchant Center. When setting up Shipping, you have a wide array of options including configuring for flat rate shipping such as Free Shipping, carrier rates (known as carrier-calculated) where merchants can include all of their shipping providers and Google will use that to determine shipping rates on most or all products, and you can also even set up weight tables to customize shipping rates based on the weight of your products (if applicable). Tax as an account-level setting is only applicable to merchants who sell in the United States. Merchants can set up for no tax charged or configure state-unique tax settings for all or some states. For those selling in the EU, it is important to mention flat tax requirements such as VAT or GST. Since these are predefined percentages, EU merchants are required to submit their price either including or excluding the tax percentage. However, if you were to, for example, submit a price in the feed that is different than that which is displayed in your store then you run the risk of having your products disapproved due to mismatched pricing information. There are also a few, feed-only Shipping attributes which we’re covering in the next Chapter so don’t skip over them! While we will get into analytics and conversion tracking later, you may also want to head on over to Google Analytics and make sure of a few things. If you are not familiar with Google Analytics at all then I would refer you over to Google’s help center for additional resources. Universal Analytics Tracking Code: Be sure to have your Universal Analytics Tracking Code snippet set up in your site’s source code. BigCommerce store owners can do this without having to edit their code directly. Ecommerce Settings: Navigate to the Admin dashboard of your account and under View settings click on Ecommerce Settings. Enable these settings. We’ll get into Enhanced Ecommerce Settings and Goal Setup later. This is just something quick and relatively easy to do so you can get it out of the way fast. Whether you are selling more common consumer goods or even a unique product line, the one thing you will most definitely not get away with is neglecting the optimization of key product attributes such as product titles and descriptions. It doesn’t just go for Google Shopping. Product data optimization is key for all traffic sources bringing potential customers to your store. At its core, it is crucial for simply educating your visitor so that they can make better purchasing decisions. Optimized product data governs how well your products rank in both organic and paid search results. Elements of your products such as product titles and descriptions contain the essential keywords and phrases that search engines use to gauge the quality of your store’s pages. While our focus may be Google Shopping, I cannot stress enough on how vital it is that you put in the time and effort to optimizing your product data for search engines. The very same principles in SEO carry over to paid search advertising. However, since we are talking about Google Shopping I’d like to impart a little advice to help get you started. In rating the importance of optimizing your product data for Google Shopping, your product titles should be number one. While all the data you send to Google contributes in some way to ranking, product titles are hands-down your leading contributor. I often equate product titles to being 80% of the reason why your ads will show up when people search on Google. The other 20% is comprised of other feed attributes (such as product descriptions) and bidding (which we will get into later). This is because, unlike text ads, Google Shopping ads do not rely on keywords as part of their structure and thus you are not bidding on keywords in the traditional sense. Instead, your keywords in Google Shopping stem mostly from including key terms within your product titles. At the same time, however, your product titles should also follow a natural structure that is both descriptive and akin to how consumers search online for products. Character Limit: Although the maximum character limit allowed by Google is 150, it is recommended to keep product titles no longer than 70 characters. This is because past 70 characters, Google will truncate your titles anyway. Front Load Key Terms: First off, avoid “keyword stuffing” at all costs. That is just a bad practice and can cause issues for you down the line. By “front-loading” I simply mean making sure to keep the most valuable terms as close to within that 70 (or 150) character limit as possible. Be Descriptive Yet Contrite: Obviously you want to include the actual name of the product, but there are other terms that both search engines and shoppers want and need. Looking at apparel and accessories as a prime example, including valuable information such as color, size, and gender are crucial. In other verticals, such as auto or machine parts, including part numbers (MPN or manufacturer’s part number) in the title can also be of substantial value. Be Natural: So, when optimizing titles, think about how you would search for your product online or even ask friends and family members that same question to see how they would search. If you’re still in the early stages of launching your ecommerce business, do not hesitate to research similar businesses to see what they may be doing. Perform your own searches on Google or visit other sites for additional perspective. I always say that a good product title should roll off the tongue. At the same time, you still must adhere to those Product Feed Specifications for title or risk having your product disapproved by Google. For additional information on optimizing your product title, check out the following post from one of our very own experts. If titles are to be your primary focus, then descriptions should most assuredly be the secondary. Out of all the other attributes you can send to Google, there’s only two places where keywords come into play: product titles and product descriptions. The cool part about description optimization best practices is that they are pretty much aligned with the same one’s for product titles. The one key difference is character limit; Google allows a maximum of 5000 characters for product descriptions, leaving plenty of room to optimize. Front Loading Key Terms: We can use the maximum limit allotted for product titles (150) as the perspective for front-loading in descriptions as well. So, it is important to include those high value terms as early on in your product descriptions as possible, like within those 150 characters. Be Descriptive: You’re probably thinking “duh Tony”, but it’s true. Product descriptions are your time to talk up a big game about what someone may want to purchase from you. It’s where you can include everything that you were unable to in the short character limit of your product titles. Be Natural: I do apologize for the déjà vu here but just as you may want to be very descriptive you also don’t want to overdo it. We aren’t trying to write a book here. We’re just trying to provide both Google and your potential customers with all the vital information they want and need. For more specific information regarding descriptions as a requirement in Google Shopping, feel free to refer to the unique specifications outlined by Google. If you took the time to research all of Google’s aforementioned policies and acclimated yourself with their Product Feed Specifications, you’ll know that there is a lot more data that Google not only requires but also data that is completely optional. (In fact, different retail verticals also have different requirements when it comes to submitting product data). A product ID is how all three Google services (Merchant Center, Google Ads, and Analytics) identify your products. An ID is typically assigned directly from your ecommerce store’s native settings. Parent SKU: Any base product or Parent SKU will have not only a primary ID but also a secondary or ‘Sub-ID’ that can be sent to Google. Options: Product Options or Option SKUs will have their own dedicated product ID. Separate but equally important, the Link is a product page’s URL while the Image Link is the URL for your product image. Maybe you’ve spent time photographing your products yourself or got your product images from a reputable source. In either case, make sure they’re high quality and set on an all-white or neutral background. If you are in the Apparel & Accessories category, having your products photographed while on models is a great way to connect with shoppers on a human level and show them how clothing may look on them. Google will disapprove your products if they include anything that takes away from the actual products themselves like watermarks or overlaid logos, so be sure to only use clean images of your products. If you’re selling on BigCommerce, do note that both Parent SKUs and Option SKUs can have their own, unique images editing sections. Availability is split into 3 unique predefined values. Additionally, availability can be synced automatically by enabling Automatic Item Updates in Google Merchant center. Of course, you need to send product price to Google, but at the same time, if you are running any discounts, you can also send Sale Price to override the default price of products in your feed. Essentially, you can assign a predefined category for your products which is set forth in Google’s Product Taxonomy. Product Type is a user-defined value that is served its best purpose as a tool for organizing or structuring your Shopping campaigns in Google Ads. It is also believed that product type has a strong impact on product ad rank so including it regardless may be incredibly beneficial in the long run. It can follow a similar string format as Google Product Category, or it can be a single value. For example, you may want to assign a more unique category to shirts you sell such as by classifying a group of products as tank tops which is not part of Google’s taxonomy tree. As of today, all three of these attributes are required for all merchants that sell recognizably manufactured products. MPN or Manufacturers Part Number is more typical in industries such as Auto Parts or Machinery. However, if your products do not have an MPN then you can make them up. Many merchants simply set the MPNs to match their SKUs. GTIN refers to a group of officially standardized product identifiers including UPC (USA), EAN (Europe), and ISBN (Books Only). GTINs can be sourced directly from the manufacturer of a product. Did you know? Option SKUs in BigCommerce stores have their own fields for entering UPC/EAN. This applies mostly to merchants who sell custom or homemade goods. You can submit the attribute identifier_exists and set the value to FALSE. However, if this is the case, then you cannot send any of the above-mentioned identifiers: Brand, MPN, or GTIN. All three must not be included in the feed if you wish to use Identifier Exists. As of earlier 2018, Google will default any product submitted without a condition to ‘New’. However, if upon crawling your website Google were to find a different condition, then products can be disapproved. These attributes are only applicable to merchants who sell clothing or accessories such as jewelry or handbags. For clothing and shoes, all four attributes are required by Google. Accessories like watches and jewelry require all but size. In the case of jewelry, color can be submitted with a value of multi whereas other products like shirts or sneakers would have to be submitted with an actual color (blue, green, etc.). Size typically follows the generally accepted system of S (Small), M (Medium), L (Large), and so on. Merchants, however, also have the option of submitting OSFA (One Size Fits All) for products without a distinct size system. There is also size type which is optional but can be beneficial to improve data quality: regular, petite, plus, big and tall, maternity. There are two other, but optional attributes for this category: Material and Pattern. Submitting these can improve your data quality and are especially great when selling things such as loose fabrics and upholstery. If you’re selling on BigCommerce, it is highly recommended that you set color and size at the option SKU level for convenience. Legacy Google Shopping settings also allow for the input of the above-mentioned attributes. Do note that Legacy settings are only applied at the Parent SKU level. Custom Labels are completely optional, but definitely worth a mention. Much like product type, Custom Labels are used almost entirely for structuring and organizing your Shopping campaigns. Custom Labels can be attached to products to form unique groups that can be easily identified. They number 0-4 and can be user-defined. For example, you can take all your low-priced products (where your margins may be razor thin), apply any Custom Label and name that Custom Label anything you want (maybe “low margin”). Also note that if you add, for example, Custom Label 0 to your feed that it does not have to be the same for every product. 20 products can be Custom Label 0 = low margin while another 50 products can be Custom Label 0 = high margin. For more, feel free to check out this guide on best practices when using Custom Labels in Google Shopping. This is also a user-defined optional attribute which can be submitted to classify specific groups of products. By applying a Shipping Label to one or more products in your feed, you can create unique shipping configurations in Merchant Center based on your set label. If you submit any one of them in your feed but do not include the other two then your products can be disapproved by Google. These attributes help Google better qualify your shipping settings when using carrier-calculated rates at the account level in Merchant Center. You must also include the unit of measure (inches, centimeters, etc.) when sending these 3 attributes. Submitting Shipping Weight also requires that you include the unit of measure (pounds, kilograms, etc.). It is also used by Google to better support carrier-calculated rates. If you submit shipping weight, but the weight is too heavy and therefore not supported by your shipping provider, your product can become disapproved. In Merchant Center, this disapproval is indicated by the warning missing shipping. This can be a bit misleading but if you review the product details in Merchant Center then you will see a message indicating that the product is too heavy. All merchants have a few options when it comes time to send their product data feed to Merchant Center. Inventory Size: Merchants with higher product counts (thousands or more) will find that automation is their best friend. Product Complexity: A great example would be apparel and accessories merchants due to requiring additional unique yet required attributes. This can make feed setup and maintenance more difficult. Time & Capability: You’re busy enough sourcing your products, maintaining your store, and fulfilling orders. After all of it, do you even have the time to do everything by hand? Any app or direct integration to your ecommerce platform/provider is by far your easiest and most effective option for sending your feed to Google Merchant Center. All you BigCommerce store owners, site admins, and marketing partners out there will benefit greatly from free apps like ours, Google Shopping by Sales & Orders, which automate the majority of feed setup and more. Automation: Native apps like ours are already hooked into your products in your store and are designed to automatically collect and send all required attributes to get your feed approved in Merchant Center. Usability: By providing a feature-rich interface and out-of-the-box feed management tools, native apps can make managing your feed an absolute breeze. Cost-Effective: Some apps are totally free, built by your ecommerce provider’s engineers or certified partners. Others may come at a one-time purchase. There may also be one-time or recurring payment upgrade opportunities for those who may want to scale their feed management capabilities with more advanced tools. Affordable, Optional Upgrades: For those looking to modify or alter their feeds or even optimize key data points such as product titles, apps like ours come equipped with learnable add-on features that won’t drain your wallet. Dedicated Support: Apps are often only as good as the people behind them. When you’re in need of guidance or if you run into any issues, a quick live chat session or phone call with a real person can truly make the difference. Do-It-Yourself: Apps like ours are still, at their core, DIY tools and you can refer to written and video guides if you are adamant on doing everything on your own. Learning Curve: Not really a “con” per say but any app you use for any aspect of your marketing will always come with a learning curve. This goes for everything including your chosen ecommerce platform. Regardless of the app or plugin you choose, you should always read every piece of documentation provided and keep up with new feature releases as well. It’s important to do research on the specific options out there for your chosen ecommerce provider. Not all apps are free and each one is unique in both feature set and usability. For those ultimate do-it-yourselfers out there, submitting a feed manually offers up a few benefits. You’ll of course have to build your feed from scratch. I’d recommend using Google Sheets as your medium as it is the easiest route. Other formats such as .TXT or XML would still most likely require some form of export tool, but some ecommerce platforms do have these native to their back-end control panels. Also, Google’s Product Feed Specifications outlines unique formatting requirements for different file types. The format in a spreadsheet like a Google Sheet just so happens to be the easiest one to work with in my honest opinion. Full Control: You are in the driver’s seat the whole time with this method. It’s Free: You will not incur any additional costs by going it alone. Some Automation: You can still rely on such things as Fetch Schedule and Automatic Item Updates from Google. Time & Effort: While it may not cost you in dollars, doing it manually with even moderate inventory levels can be quite arduous and time-consuming. Upkeep: If product details in your store change then you must go in and manually update the feed to match. Larger Inventories: When you’re dealing with tens or hundreds of thousands of unique products, the tasks of not only creating but also maintaining your feed may simply be too daunting of a task. Ecommerce Platform: You really need to find out what can be exported from your ecommerce store and what you may have to fill in after the fact, so this can just further add to the time and effort needed to get going. By no means am I against manual submission. For merchants with very small inventories that don’t change much at all then this can be a very cost-effective and easy route to go with. But, that doesn’t mean there aren’t better ways. For merchants with the budget but not the time to spare on a service, choosing a company that specializes in feed management to handle it all for you can be of great benefit. There are very few what you may consider “cons” to working with the right company. While feed management may come at more of a cost than some of the above-mentioned options, it also comes with the substantial benefit of working with experts in what they do. Trustworthiness is paramount in choosing a company to work with. We’ve come to that time! You’ve set up your required Google accounts, linked them properly, generated your product feed, and most if not all your products are approved in Merchant Center. It’s a glorious feeling, I know. Don’t hesitate to take a step back and marvel at the accomplishment. It really does take a lot of time and effort and I applaud you for making it here. You can finally begin creating and structuring your very first Google Shopping campaign. Before we get into the “how”, I just want to go over some of the basics of both Google Ads and Shopping campaigns. Prior to building and managing your campaigns, I believe it is imperative to understand the fundamentals to better ensure a good experience later. Google Ads itself may seem intimidating at first, but if you spend some time reviewing Google’s help center and acclimating yourself with the Google Ads interface then you’ll find that it is a relatively easy-to-use platform despite its steep learning curve. Do know that if you are just getting started with Google Ads and are not familiar with its history, that Google has made some significant changes recently. The biggest one being the complete overhaul and rebranding of what many may be more familiar with as AdWords. If you are familiar with some or all those recent changes, then I would highly recommend starting to become efficient with the new version of Google Ads. It differs tremendously in both form and function than what you may already be accustomed to from working with the previous AdWords, and there’s no telling how long the old version will still be around. Since I don’t know what version of Google Ads everyone is using, I am defaulting to the most current for this guide. If you prefer (and still have access to) the previous version of Google Ads (AdWords), then I recommend checking out this guide on efficient ways to set up and structure Google Shopping campaigns. A conversion refers to when someone performs an action on a website, such as when they make a purchase from an online store. It is imperative that, before setting up your campaigns, you ensure that you have completely and properly set up Conversion Tracking in Google Ads. This is the only way both Google Ads and Google Analytics will be able to report on purchase behavior for your online store. Google Ads Conversion Tracking: This type of tracking is set up in Google Ads and can be configured to your needs. At the same time, however, ecommerce merchants must adjust tracking code snippet details to ensure transaction details are recorded correctly. Additionally, you’ll want to ensure that your tracking code is properly installed on your store. See your ecommerce platform or provider’s help documentation for assistance with this as implementation varies greatly. Google Analytics (Goal) Conversion Tracking: This is the recommended way to handle conversion tracking, especially if you own a BigCommerce store. This type of tracking works off your hopefully already active Universal Analytics tracking snippet. After enabling Ecommerce Settings in Google Analytics, you will able to import a unique conversion type into Google Ads known as Transactions. Without this you will be unable to understand the true performance of your Shopping campaigns. The various forms of targeting one can set up for their campaigns in Google Ads all play a vital role in both campaign management and overall performance. In its most basic form, targeting really refers to Location targeting and how you can set up your ads to display in specific countries, regions, and even more granular levels such as by state or even zip code. There is also location exclusions which you can use to prevent ads from appearing in regions where you don’t provide a service or where you don’t sell products. Devices: Specifically refers how you can adjust campaign settings so ads can or cannot appear on select devices: Computer, Mobile, Tablet. Remarketing: Target previous visitors to your website and deliver unique ads to entice them to come back and purchase again. Demographics: Such things as Gender and Age, you can build targeting criteria specifically geared to those segments. There are quite a few other targeting methods but not all apply to our main topic of Google Shopping. In Shopping campaigns, especially for anyone just starting out, the two primary types of targeting you’ll be setting up are locations and devices. We’ll be covering those in greater detail soon. For those who may be unfamiliar with Google Ads campaigns in general, I wanted to first go over some general things about campaigns themselves. More specifically, we’re going to go over what a traditional campaign, like a search (text) ad campaign, looks like in comparison to a Shopping campaign. While text ads themselves on Google have changed quite a bit in both end-user form and function, their inherent structure has not. Level One – Campaign:At the highest level lies the Campaign itself. A campaign forms the base of the hierarchy and is typically where general settings, such as location targeting and budget, are held. Level Two – Ad group: Ad groups are the secondary structure element of a campaign and, in text ads, are where both the ads themselves and your keywords are held. Ads: Your actual text ads. Google Ads now allows for 3 Headlines and 2 Descriptions in the latest version. Keywords: The words and phrases you’ve chosen to help trigger when and why your ads appear when someone searches on Google. Keywords are also where bidding actually takes place as you can set unique Max CPC bids for each and every keyword or blanket every keyword in the same or similar bid range. While there are other things like negative keywords and ad extensions, this is really the bones of text ad campaign structure. However, there are two major differences that you will notice when building a Shopping campaign. No Ad Building: In Shopping you need not actually create your ads on your own. The Shopping ad formats are generated by Google automatically and uses your product data from your feed in Merchant Center. No More Keywords: As I had mentioned in previous chapters, Shopping ads do not rely on traditional keywords to govern when and why they appear when shoppers search on Google. In lieu of ads and keywords, Shopping campaigns get their very own, extra structural component known as Product groups. Product groups essentially house your products (ads) and you can use product groups to build a manageable structure for bidding and performance analysis. A Product group can be comprised of several products or even just one product. There is also an additional structuring element to Shopping campaigns called subdivision that is directly linked to product groups. Basically, subdivision is the practice by which a merchant or advertiser can organize their Product groups based on their own style of campaign management. It is at the Product group level that eithergrouped-style or product-unique Max CPC bidding in Google Shopping takes place. Bidding is essentially how merchants and advertisers pay for placement on search engines like Google. By setting a Maximum Cost-Per-Click (the max you’re willing to pay for a single click) on keywords or products, you can increase the probability of your ad being shown in a better position when your bid is higher than your next closest competitor. Maximum CPC has a direct impact on ad rank. The actual cost you pay for a click is what is minimally required to maintain a select ad position. Typically, it is slightly higher than your next closest competitor who may be advertising with similar keywords or the the same or similar products. If you are at all familiar with text ads, then you know that true bidding takes place at the keyword level. This differs greatly in Google Shopping where there are no keywords. Instead, merchants and advertisers bid on the products themselves, whether it by group bidding or product-level bidding. Bidding is one of the ever-important aspects of managing ad campaigns in Google Ads. This is how you can turn ad campaigns into profit machines. You’re essentially playing a balancing act with your cost-per-click on your products. You are trying to bid efficiently to ensure enough traffic, enough sales, and a profitable return on your ad budget. Manual: User-controlled where the advertisers sets their own bids and must also adjust bids manually in an effort to improve campaign performance. Enhanced CPC: Google will automatically adjust your bids when its system believes you are more likely to get conversions. When increasing bids, Enhanced CPC will not have a bid cap and thus can increase your bid by any amount it deems necessary to improve position and conversion probability. Target ROAS: As a prerequisite, merchants and advertisers are required to have some form of conversion tracking already set up. Fully automated, all you provide is a desired ROAS target (in percentage). Google will then work to try and hit your ROAS target. The bidding type you choose really comes down to your experience with Google Ads and Google Shopping. There are pros and cons to both manual and automated strategies. While manual bidding may be more time consuming without the assistance of specialized software, it also provides the greatest level of control over managing bids. Automated bid strategies like Target ROAS, can be greatly beneficial for those with massive inventories or who do not have enough time to adjust bids every week on their own. At the same time, however, you are giving up a lot of control. The Google Ads UI has a great analytics feature set including comprehensive dashboards, graphs, and tables. You can customize it to your liking. Reporting dashboards also have substantial filtering capabilities, so you can focus your analytics to what you need to know at different levels of your campaigns’ performances. I suggest spending some time getting familiar with the Google Ads UI because you’re going to spending a lot of time in it. You can refer to the Google Ads help center for more detailed information. For those who may be completely unfamiliar with Google Ads, making sense of the various data points in its reporting can seem a bit intimidating. Merchants especially need understand at least the basics of ad metricsor what are referred to as KPIs (Key Performance Indicators). A KPI is essentially any ad metric that is indicative of positive or negative trends in your campaign performance. Although Google Ads offers up quite the long list of KPIs to refer to, there are most definitely a handful that you should know through and through. As the name suggest, a click is recorded when someone clicks on one of your ads. Obviously, that’s a important to track because it is essentially the measure of traffic your store is getting from your ads. Clicks are also used in the calculation of other vital metrics such as CTR (click-through-rate). Price Competitiveness: If you are consistently priced higher than your competitors then you are less likely to get clicks. Other Offers: Do you offer Free Shipping? Do you not charge Tax? Just because your price is lower doesn’t mean you are price competitive after shipping and taxes. Product Images: Lower quality product images in Shopping Ads can deter users from clicking. Displaying the wrong image or an image that doesn’t totally match what the shopper searched for could potentially be even more impactful on clicks. An impression counts anytime your ad is displayed and viewed by someone searching on Google. Impressions are crucial to track because they tell you if your ads are even being delivered to your target. Impressions are also used in the calculation of your click-through-rate. When dealing with Google Shopping, impressions become even more important because they can indicate a lot than if you are bidding high enough. Impressions in Google Shopping can also be used to monitor issues where your products may be disapproved, or your product data is not up to snuff. If you’re are consistently seeing trends of low impressions then you may want to check merchant center or your product data optimization to see if either may be a primary reason. Click-Through-Rate is calculated by dividing the total number of clicks a campaign or ad had received by the total number of impressions. Essentially, it is the rate at which people view and then click on your ads. Most marketers today agree that the base CTR to want to hit for is roughly 2%. So, for every time your ad is displayed (impression) it is clicked on only 2% of the time. While that may seem low, you must understand shopper behavior in general and that there are a lot more shoppers out there than ads you are displaying. If you are below a 2% CTR and looking to improve, you’ll want to look at the very same places as I had mentioned before when optimizing for both impressions and clicks such as price competitiveness. For those with above a 2% CTR then KUDOS! Even being slightly over that average is a very good sign. The hope is that you are also getting conversions too though. Across all ads in your campaign(s), the overall average cost of each click is Avg. CPC. Now, Average CPC is a great reference metric on its own. It helps you keep tabs on how much your spending to generate traffic to your store. It’s very important to keep your Average CPC in-check to ensure that your cost doesn’t overtake your margin. This is the total or actual cost of all accumulated clicks on your ads. It is beyond important, for obvious reason, to track your overall cost to advertise. Your cost is what you measure your conversion performance against and, when comparing it to purchases made via your ads, allows you to determine your ROI (Return-on-Investment) or ROAS (Return-on-Ad-Spend). Cost is also used when calculating CPA or Cost-Per-Acquisition – the amount you pay to acquire a customer. It is also a leading factor in your CLV or Customer Lifetime Value. Well of course you must track sales or advertising would be all for not! I know I covered this in an earlier chapter, but a conversion is counted when someone performs an action on a website such as when filling out a form or checks out. Conversions don’t have to be just that, and you can set up more custom or unique conversion actions such as when someone clicks a specific link on your website or calls your business. Cost also comes into play here because Conversions are measured against cost to calculate your actual return on advertising. Cost-Per-Conversion (not to be confused with CPA or Cost-Per-Acquisition) is basically what you pay in ad spend overall after someone purchases from your store. Its calculated by taking your total cost and dividing it by the total number of conversions. By far a crucial metric to track, having a high cost to convert can indicate that you are spending too much, and you could be advertising at a non-profitable rate. Calculated by dividing your total conversions by total clicks, this is the rate at which shoppers are purchasing products in relation to how many times your ads were clicked on. Just like CTR, the generally-accepted average Conv. Rate to shoot for is around 2%. If you are consistently seeing a lower CTR (below 1%) then you may want to look into your store design, checkout process, and other on-site elements which may be slowing, deterring, or even preventing shoppers from completing their purchases. In ecommerce, Conversion Value translates to the monetary value of a purchase. This, again, ties in with cost metrics to produce analytics on your return on advertising. What’s nice about tracking Conversion Value for an ecommerce business is something we mentioned earlier regarding setting up Google Analytics Based Conversion Tracking. After setting up Ecommerce Settings in Analytics and then linking your account with Google Ads, the two will share transactional data between them. The popular acronym ROAS stands for Return-on-Ad-Spend and is the direct correlation between your sales and cost or conversion value divided by cost. I wanted to note that, in some cases, you may see ROAS represented as a percentage but ROAS is not really a percentage. A purchase is made from your webstore valued at $100. Overall, it cost $50 in ad spend to bring about that singe sale. The return is calculated by $100 ÷ $50 = 2. That 2 is then represented as 2X or 2 Times. In other words, your return is twice that of your ad spend. Now, this is very industry/margin dependent but a high ROAS (7-10X) can be indicative of strong performance while a lower ROAS (1-3X) could mean that your advertising is not profitable enough to warrant the spend. What we just covered are merely the more commonly used KPIs for reporting on Google Shopping campaign performance. There are other metrics that Google Ads power users (marketers and advertisers) may be more accustomed to using alongside the aforementioned primary KPIs. Impression Share: The percentage of impressions you received against those you were eligible to receive. A high impression share can be indicative of when a product ad may be showing more often against your competition. Conversely, a lower impression share can mean that your competitors are outbidding you for the same ad positions. Click Share: Essentially the same thing but only reports on clicks you received compared to what you were eligible to receive. The major difference here is that Click Share is more closely related to CTR (click-through-rate). A low click share can mean that your ads are not as compelling to draw the shoppers attention. Competitive metrics are often underutilized in overseeing Google Shopping campaigns, but they should never be discredited regarding the value of the insight they can provide. I am a big proponent for self-education and I cannot stress how important I believe it is for merchants to go beyond the basics to learn even more about what Google Ads can do and how its reporting features. Apologies for the tease in the earlier chapter, but yes, that time has come. 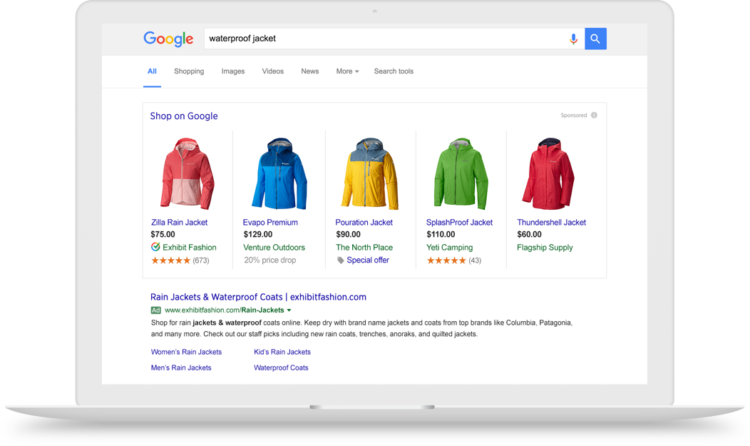 We can now get into creating your first Google Shopping campaign. I do want to preface that there are many, many different approaches to building and structuring Shopping campaigns. First, we’re going to cover the basics including general settings, setup, and structures. Afterwards, I am going to go over some of the more advanced strategies merchants can take advantage of to improve their ability to manage and optimize for profitability. Before getting into the remainder of our guide I wanted to take a moment to mention the newest version of Shopping campaign available to merchants: Smart Shopping (aka Goal-Optimized). Google released Smart Shopping Campaigns along with its official rebranding to the new Google Ads experience. Smart campaigns take advantage of Google’s Machine Learning to automate (in near entirety) everything from bidding to network/targeting control. In a Smart Shopping campaign, Google controls bids using a maximize conversion value or Target ROAS rule and distributes your product ads across all its networks automatically including Search, Remarketing, Display, YouTube, and Gmail. Very little is controlled by the advertiser when it comes to Smart Shopping campaigns. There isn’t much data yet surrounding the benefits of Smart Shopping versus traditional Shopping campaigns. We’ve seen some successes, but since its still very early on in the release more data is still needed to understand the true potential. Check out Google’s help center for additional resources on Smart Shopping campaigns. The below goes over building a Shopping campaign from scratch, the original way merchants and advertisers were able to create them. Note that this guide is, again, based on the new Google Ads experience. Logging into your Google Ads account. Navigate to the Campaigns section using the left navigation menu. Click on the large, blue ‘+’ icon located above the campaign table. Select + New campaign from the dropdown list. Since we will be building this campaign from scratch, on the next page select the last option for Create a campaign without a goal’s guidance. For campaign type select Shopping. Next, make sure your linked Merchant Center account is the correct one and also set your country of sale (where products are sold and shipped to). In the final section of this page, click on Standard Shopping campaign and then click Continue at the very bottom. A new page will come up and this is where we get into the more governing settings of campaigns including targeting. Start by naming your campaign. Make it recognizable. We will often name a first-time campaign Primary. This is so we know its purpose. For first-timers, there is a section that includes options for Inventory filter, Local Inventory ads, and Campaign URL options. You can skip over this and leave them set to the default. This next section is all about bidding, budget, and campaign priority. Select your Bidding strategy. If you’re brand new to Shopping, then choosing an automated option may be beneficial. By selecting Manual then you will be managing your bids on your own without the help of Google’s tools. Set your Daily Budget. This is the total amount you wish to spend per day on your ads. While you may not spend this every day, it is important to note that, on some days, you can actually spend twice your set daily budget. What Google does is it balances out by ensuring you won’t spend more than your total expected monthly budget (“daily budget” X “number of days in a month”). Our team generally recommends starting with at least $10/day for beginners so thus you would only spend $300/month. Spending too little per day can have a negative impact on how often your ads can appear when people search on Google. Another method for determining a proper daily budget is for every 1000 products spend no less than $10/day. Standard: Deliver ads evenly over time. Accelerated: Deliver ads as quickly as possible. We always recommend choosing Accelerated delivery. Standard delivery can prevent your campaign from utilizing the entirety of its budget and thus your ads may not be shown as often as possible. With Accelerated delivery your budget may run out more quickly, but your ads will show far more often. As long as your budget is high enough, even with Accelerated active, your ads should show all day. Campaign priority is an extremely important aspect of Shopping campaign configuration as well, but really only when you are working with more than one campaign. The settings include Low, Medium, and High. When working with multiple Shopping campaigns, higher priority level governs which campaign should expense its available daily budget before another that may be set at a lower level. For example, a campaign set to High priority will always run and spend its budget before one that is set to Medium or Low if the same products live within both campaigns. If the products in each campaign differ then the priority level does not take effect. Anyone just starting out, who may only be running one campaign, can set their priority level to any of the three. We’ll get into priority levels in a bit more detail later including how to use priority levels properly when managing multiple Shopping campaigns. The final section of the campaign set up is almost entirely about Targeting settings. By default, a standard Shopping campaign only targets the Search Network. This includes general search and the Shopping tab on Google. When setting up your campaign, you also noticed that Google has pre-selected Include Google search partners. We suggest leaving this as checked because it’s what allows your Shopping ads to appear in other areas of Google such as the images tab, and even on YouTube. For more detailed info about search partners you can refer to the Google Ads help center. You’ll also see that, in this standard setup at least, your ads are defaulted to be shown on all devices which includes computers (desktops and laptops), mobile (smartphones with browsers), and tablets. Adjusting which devices you want your ads to appear on happens in device management and bid modifiers which we will cover later. Location Targeting is the “final step” of campaign setup and one of the most important. As the name suggests, this is where you’ll configure not only what region/country you want your ads to appear in, but also those you wish to exclude. You can even target more granularly such as in the US where you can choose specific states to display in and exclude others. There are also two other sub-settings for location targeting you should make a note of called Location options. Target: people in your targeted locations. Exclude: people in your excluded locations. This will better ensure that your ads are delivered to only the most qualified shoppers. At the very end of campaign setup there is Start and end dates. This can be ignored for the most part. It is primarily used when you only want to run a campaign for a select period of time. Maybe it’s another campaign you build specifically for a holiday sale. Still though, it is rarely utilized since most will opt to manually pause or enable campaigns as needed. When you’re finished up, click SAVE AND CONTINUE at the very bottom. Before going any further it is crucial to note that, in Shopping campaigns specifically, ad groups can only house a maximum of 20,000 unique products (IDs). If you have over 20,000 products, then you will need 2 or more separate ad groups to house all of them. This part is super easy and far less involved, but now we must create an ad group for this campaign. Important: You should set your initial default Max CPC to a nominal amount. Shopping ads tend to cost far less than text ads (cents versus dollars). For products on the lower price scale ($5-$25) consider keeping your default bid between $.10-$.15 whereas products at the higher price range ($50+) you can start off between $.25-$.50. We will be learning about adjusting bids later so hang tight! Click SAVE at the very bottom to finish. Pause your newly created Google Shopping campaign now! This will prevent your ads from running until you decide to set them live. I highly recommend this because the bulk of campaign creation can take a while to learn. Remember that an Ad group is what houses your Product groups and that those can be comprised of multiple products or contain a single product. What we have just done is create one campaign and one ad group. By default, Google sets you up with one product group as well. This is called an All products product group and, as the name suggests, contains every product from your Merchant Center account. Now, after completing both campaign and ad group set up, we can finally get into the meat of Shopping campaigns: subdivision and structure. Just to recap what we went over briefly in Chapter 4, structuring a Shopping campaign follows a system called subdivision. The whole point of subdivision is to break down a campaign to achieve a certain level of granularity. We want to be able to control not only which products to advertise, but also how we will be bidding on those products. Right now, all we have is an All products ad group where we can only set a single, default bid for every product in the campaign. Set unique bids for each product or build small groups of products and set the same bid for items with similar qualities or shared characteristics such as price or category. Exclude (pause essentially) products that maybe we don’t want to advertise due to razor thin margins or a lack of inventory. Monitor product performance at a much deeper level so you can understand exactly which of your items are driving most of the conversions versus those that are merely wasting your budget. Now, there are a lot of ways to structure a Shopping campaign. Every marketer or agency has an approach that they prefer. Some structures are very simple whilst others are incredibly complex. I don’t believe there is any one right way to handle subdivision. All structures come with their own inherent strengths and limitations. For our journey together, I want to make things as easy as possible. That way, later, you’ll have a strong head start to then get into more advanced approaches to Google Shopping. Ultimately, the goal is still granularity so that is our ongoing theme here. Start by returning to Google Ads, back to your All products product group that we had just created. Hover over that product group and you’ll notice a ‘+’ icon appear to the right. Click on that. Google Ads will switch views to the Subdivision menu and adjacent to Subdivide All products by: you should notice a dropdown menu. Click on that to open your subdivision options. This might be where things can start to get a little confusing but fear not. Category: Based on the Google Product Categories you had set in your feed, you can build several smaller product groups. Each will have products with the same Google Product Category within. I prefer not to use this subdivision type. Not that I don’t believe it to be necessarily a “bad” choice. I just find other options to be more efficient. Brand: Simple. Takes your All products product group and breaks it down into smaller groups based on Brands as submitted via your product feed in Merchant Center. I love this option for beginners because it makes things very easy to deal with. Controlling products by brand is not only efficient but it can also aid in bid management since most merchants have average margins based on brand. structure that may not be suited for those just getting started or those without much experience. Product Type: Like Brand, this is one of my favorite options for beginners or new advertisers. The one prerequisite, though, is that you must have used it in your feed. Remember that you can set product type to whatever you want which can make it very easy to identify groups of products. If you’re not as versed in Google Shopping or feed management then this may not be a great fit for you. But, that doesn’t mean you should ignore it. If you did spend some time getting product type into your feed, then this is a great option for subdivision. Custom Label (0-4): For those with more experience in feeds and Google Shopping, using Custom Labels can be an awesome way to structure your campaigns. You have up to five Custom Labels to choose from and each of the five does not have to be the same for every product. There are some approaches to Shopping structure that rely purely on Custom Label as the method of subdivision. While this may work for some, Custom Labels are more commonly used to identify subsets of products with unique characteristics such as items that are currently “on sale” or “clearance” for example. Item ID (Bulk values): Again, far more suited for advanced users, this is the second way to handle subdivision to break down your campaign to the pure item level. In this method, however, you will be taking a list of your product IDs and manually adding them without the use of Google’s predefined subdivision options. Afterwards, each product would essentially “live on its own”. This is the only way to achieve 100% granularity in Shopping from directly in the Google Ads interface. All other things being equal, if you could only use Google Ads to perform subdivision, this would be our team’s preferred method. To be completely honest, I have never used any other subdivision option than what we just covered. In choosing which method is best for you the most important factor in deciding would have to be product count. Anyone with a relatively low product count, numbering in the tens or low hundreds for example, may find going straight to pure item level (Item ID) structure is the best route. Fewer bids to manage making it very easy to not only set unique Max CPCs per product but also optimize those CPCs over time. Anyone with 200 or fewer products can use the first available Item ID subdivision option to create that structure immediately. Fewer products to review in Google Ads will make analytics and reporting very easy and save you a lot of time filtering to find performance trends. Now, the more products you have, the more important it is to develop a manageable structure for both bidding and analysis. This is best achieved by combining methods to take advantage of Tiered Shopping Structures. It’s important to notw, this is best suited for anyone with over 200 products in their campaign. With this method you will first take one “top-level” or Primary grouping structure for the entirety of your catalog, and then break that down once or twice again until you achieve the structure you wish to base your bid management and product analysis on. Before we move on scroll down to the bottom and take note of the Everything else in ‘All products’ group. Google Ads has created this automatically and it essentially acts as a catch-all for any products that did not match your original subdivision criteria. In this example, it could be products that were submitted without a brand. If all your products have a brand, this everything else group should have nothing in it. For that reason, you can exclude this product group as it is unnecessary. Don’t subdivide any further and set brand-level Max CPC bids. Those bids will default to all products within each group. When selling products that are moderately priced, keeping bids in the lower teens would be best. Consider starting at a range like $.15 to $.25 to avoid overspending right from the get-go. The only limitation here is that you won’t achieve that full granularity, so you’ll be missing out on the benefits of granular bid control and reporting. Subdivide once more to achieve product-level granularity in each brand group. You can then set unique Max CPC bids for each product. This is where you can get a little more specialized in your bidding tactics. You should focus on product margin as the basis for determining initial Max CPC bids. Products with very thin margins shouldn’t be set above a few cents while products costing thousands of dollars can handle bids of $.75 to $.99 with ease. Managing several hundred or even thousands of individual products can be quite the daunting task with this method without the help of specialized software like our platform Sales & Orders. Remember that you also have the option of using one of Google’s Smart Bidding Strategies such as Enhanced CPC or Target ROAS. As a best practice, consider enabling Smart Bidding Strategies after collecting some conversion history. These machine-learning options work best when campaigns already have some data collected. If you’re just starting out, then I would give your campaigns at least two weeks but up to 30 days before enabling the one of your choosing. If you so happen to choose the second option above, then breaking those brand groups down again is quite easy to do. Do know that if any of the brand group has more than 200 products inside then the method for getting to the pure item level changes ever so slightly. Let’s look at both scenarios so you can get a feel for what to expect. In Google Ads, return to your recently brand-subdivided campaign and get down to that product group view. Just as we did the first time, hover over the first brand product group on the list and click on the ‘+’ icon to open the subdivision menu once more. Select Item ID from the subdivide options dropdown. Check off the upper most box to select all IDs in the brand. Finish by clicking SAVE WITHOUT UPDATING BIDS. Immediately scroll down and locate the Everything else in automated product group and exclude it. You can now go down the list to each brand and simply rinse and repeat. With each group broken down like this you can begin to set and manage unique Max CPC bids as well as analyze individual product performance. So, what happens if any or all those brand product groups has over 200 unique products within? Now, we’ll cover using bulk values in Google Ads to break down these larger product groups. Before we continue, really the only way to do this properly would be to have your feed in an easily-editable format such as in a Google Sheet or exported to an Excel/CSV. The reason being as that all we are going to need is the Product IDs per brand. Follow steps 1-3 from before (non-bulk values) but STOP after 3. Do not check off any box. Instead, click on + Bulk add values manually. In the new field provided by Google, copy and paste your Product IDs for the specific brand group you are subdividing. Google Ads will automatically select these and only these manually inputted IDs to be used for subdivision. Immediately scroll down and locate the Everything else in the automated product group and exclude it. Once again, rinse and repeat the above steps for each brand group. After that you should be all set to begin adjusting product-level bids (if you want to, at least). That is the question, isn’t it? What are you supposed to do now that you’ve set up your first Google Shopping campaign? Well, from here on out it’s all about properly managing and optimizing your campaign for profitability. Of course, we also cannot forget about reporting and analytics. One of the worst things you can do, especially with Google Shopping, is just set it and forget it. Even if you opt for Smart Bidding Strategies like Target ROAS, you risk the chance of wasting precious advertising dollars when ignoring other aspects of campaign management and optimization. Regardless of which optimization techniques you wind up using, the key to it all is following a data-driven approach. That should go for just everything and not just Google Shopping or other Google Ads campaigns. The only way to truly make the best decisions regarding your marketing and advertising is by using historical data to govern your approach. For now, it’s time to let your campaign do their thing, let them run, let them display products, and let people begin to click on your ads (even better if they convert). Just don’t forget to keep checking in from time-to-time. There is no harm in logging into your Google Ads account every day and seeing what’s going on, especially in the first few weeks of just getting started on Google Shopping. Even if you don’t make any adjustments at the beginning, the key is to gather as much performance data as possible before performing moderate to large scale optimizations. The only change you may want to make before that first week is up is if you notice that your campaigns aren’t getting any impressions or if impressions are extremely low (fewer than 100 or so). First, before doing anything else, check Merchant Center and make sure that your products are approved and that there is no suspension on your account. Next, ensure that your product data is optimized for search, especially your titles and descriptions. If everything checks out, then increasing your current bids is the best option to help shake things up a bit. However, don’t take a bid of $.25 and immediately set it at $1! The key here is small, incremental bid increases either at the group-level or product-level. For example, if you’re original bids were set to $.25 then don’t go beyond the next quarter of a full dollar (.$50). Adjust bids by increasing no more than ten cents at a time. After each increase, however, you must give your campaigns more time to run. If you can, let another week go by before making another change. If we fast-forward a bit, the hope is not only that your campaign has been running for a few weeks (but, ideally 30 days) and you’ve accrued some performance metrics. Bidding is that main, ongoing optimization task every merchant must go through in Google Shopping. At the same time, however, adjusting bids manually becomes more and more complex when working with large inventories, but also if you opt for a granular, product-level structure. Very little work will be needed for those who kept their products in groups without any further subdivision or anyone who is using one of Google’s Smart Bidding Strategies. Anyone going with the more granular approach will find that using Google Ads Filters are quite truly the only way to manage bids efficiently. Using filters, you can set up custom product segments based entirely on ad metrics and thus follow a performance-driven approach to managing your bids. Also, one of the nice things about Google Ads is that you can save your filters and keep reusing them as needed. Zero Impressions: This one is a definite staple. Zero impressions is a very telling metric and is typically indicative of issues in Merchant Center preventing products from being eligible. At the same time, zero impressions can also indicate where you may be bidding too low or have not optimized key data points such as product titles. Additionally, however, if you have a substantial catalog (thousands to tens of thousands) and your daily budget is not high enough to support clicks on every SKU then zero impressions can help explain that as well. Review Merchant Center for Disapprovals. Review Product Data for opportunities to improve optimization. Products Approved? Increase bids by $.10-.$15 and let them run awhile longer. See if your budget is running out too soon and consider adding more daily spend. Low CTR: Click-Through-Rate is an extremely valuable metric as it can explain a lot about your product ads themselves, but more specifically how they compare to your competitors. Since the benchmark CTR for Google Ads is 2% we want to set a CTR filter much lower than that, even below 1%. Products below a 1% CTR can be indicative of a number of things including non-competitive pricing, lack of free shipping or no tax charged, and even lower-quality product images. Review product pricing and see if you can lower prices without affecting your margin. Review product image quality and ensure you are showing the correct image. Consider offering Free Shipping to your fulfillment (if you can). Create a unique Top Performing Products campaign and prioritize it above your original. Analyze performance over time and consider adding special offers for these products. Potentially lower prices (if margins allow) just enough to always appear as the better option than your competitors. Wasteful Spending: Any product spending money but not generating sales is definitely a cause for concern. It could be due to a number of, but it is important to note that your ads themselves have little to nothing to do with people actually purchasing a product. But, they key for non-converting products is cutting out that wasted ad spend and letting it be redistributed to products that are performing. First, and foremost, check to make sure your conversion tracking is up and running and that your tracking codes have been installed properly. Consider reducing bids heavily on these such as cutting down to $.10 or less. “Penny” bid these products by reducing bids to a single cent. Makes the product eligible for display but ensures you aren’t going to overspend on them at all. Review product landing pages, pricing, special offers to see if there is an opportunity to improve their chances of being purchased. Take a look at your checkout process and make sure that it is unimpeded and functioning properly. While you can get as unique as you’d like with filters, such as by combining multiple metrics, most new merchants will want to keep things simple. Focus on products that are converting and those that aren’t and use some of the logic we just discussed to make informed decisions about bidding and product optimization. Filtered or unfiltered, check off the products you wish to adjust or click the top-most checkbox to select all products. Increase: Boost bids by either a set amount or percent increase. Decrease: Decrease bids using a set value or percentage. Click Approve to finalize your changes or click Preview to see the potential effect on products. One question we get quite often is. While this can differ from industry to industry, a general rule that most merchants can follow is to perform bid adjustments no more than once per week. Anytime you alter bids, you should let your campaign run for another week or more before making any more bid adjustments. Earlier, I did not have you set up any device modifiers for your Shopping campaign. But, I had a good reason: there was no telling how well different devices would perform for you. Remember that we are following a data-driven approach to optimizing your campaign, and because we didn’t have any data yet there wasn’t much to make any informed decisions. If you are unsure of your store’s “mobile-readiness” then consider using Google’s Page Speed Insights tool to test how fast your site loads on mobile devices. It will also provide guidance on ways to optimize your site for mobile such as compressing large image files or leveraging browser caching. What is a bid modifier? In Google Ads, merchants and advertisers can set up broad-coverage, percentage-based bid increases and/or decreases for specific campaign targeting segments such as devices and locations. For example, you set a default Max CPC bid of $.40 for all products, but then you set a decrease bid modifier for mobile (smartphone) devices of -50%. Your Max CPC bid for mobile now becomes $.20. Note that devices modifiers can be set at either or both the campaign and ad group levels. If you are not performing well on a specific device, then you shouldn’t continue to spend the same or more compared to one or more devices driving all, most, or at least the profitable conversions. Conversely, if you are performing well on a device then you may want to increase bids in hopes to get more of the impression share and thus attract more shoppers, potentially bringing about a boost in sales. Setting up bid modifiers for devices is quite easy, especially in the new Google Ads experience. The most important thing is understanding the data and translating that into a decision. Now, use KPIs such as Cost, Conversions, Conversion Rate, and/or ROAS to determine which devices you should be focusing on. As an example, a device with less than ideal Conversion Rate (below 1%) may deserve a decrease bid while a device with strong ROAS performance (5X-10X) could potentially do well with an increase bid modifier. While keywords are not used in Google Shopping, Negative Keywords play a very important role in optimizing campaigns. Negative keywords essentially work to prevent your ads from appearing when people shop using those search terms on Google. Merchants can use negative keywords to stop product ads from showing when people search using irrelevant or non-converting search terms, so they are an excellent tool for cutting out wasted ad spend. Like keywords, negative keywords can be set up at either or both the campaign and ad group levels, but you cannot add negative keywords at the product group level. They also follow the standard keyword match types in Google. Exact match: Only the phrase you put in will be excluded. Phrase match: The exact phrase and close variations will be excluded. Adidas shoes Blocked The ad won’t show because the search query matches the negative keyword exactly. The order of the words is the same as well. Adidas trainers Ad served The ad will show because the search query doesn’t exactly match the negative keyword. Even though “trainers” is a synonym for shoes it will still show. Nike shorts Blocked The ad won’t show because the search query matches the negative keyword exactly. The order of the words is the same as well. Women’s shorts by Nike Ad served The search query has additional words and the phrase is in a different order. Nike shorts for running Blocked The ad will be blocked because the search query contains the phrase in the correct order, even though there are additional words. Reebok summer t-shirt for boys Blocked All the words are present in the search query regardless of the additional word in there. Kids Reebok clothes Ad served The word t-shirt and the word boys is missing from the search query. Reebok t-shirt for boys Blocked The ad will be blocked because the search query is exactly the same as the negative keyword. If you’re just starting out then words such as free, cheap, trial, discount, etc. can make for a good start to your initial negative keyword list. Building your negative keyword list over time, however, is something that should be done as often as possible (1-2 times per week is a good start). But, how are you supposed to find these irrelevant or costly keywords as you continue to optimize your campaigns? Navigate to your Shopping campaign in Google Ads. Stay on the campaign level or click to the ad group level. Click Keywords in the main navigation menu. Now you have a tabular view of all the keywords shoppers used to trigger your product ads. Review this list and look for (or use a Google Ads filter to find) search terms with cost but zero conversions. Click the large, blue ‘+’ icon to open the editor menu. Select whether you wish to add to the ad group or campaign level. Exact: Enclose terms or phrases in brackets [term]. Phrase: Enclose terms or phrases in quotes “term” (most commonly used). Broad: Leave the terms or phrases as they are. Once you are satisfied, click Save. Over time, negative keyword optimization has the potential to reduce a tremendous amount in ad spend which may have gone purely to waste. With those savings, your daily budget can begin to go even further for you. Be careful to avoid adding relevant terms or search terms that are bringing about conversions. In general, phrase match is the best option when working with negative keywords in Google Shopping. Broad match negatives, when not used properly, can have some “spill-over” effects that can prevent positive search terms from triggering your ads while Exact match terms may be “too exact” and won’t capture the entirety of a phrase used by a potential shopper. Try to plan your negative keyword management at the very beginning and the very end of the week (Monday and Friday for example). While what we just covered in Chapter 6 should help you get started, there is still a lot more to managing and optimizing your Shopping campaigns than simply updating bids or monitoring search terms. Some optimizations still take place around or within the campaigns themselves like when implementing RLSA remarketing whilst others, like Merchant Promotions, are specialty programs provided by Google that can be used to enhance the appearance of your product ads. Remarketing is something that no merchant should go without. Remarketing is essentially the practice of targeting previous visitors to one’s store and re-delivering ads to them. Remarketing requires that you add a separate Google Ads tracking code to your site or use your existing Google Analytics tracking code. Visitor behavior is then captured and used to build audiences. This allows you to segment retargeted groups using either broad or unique criteria such as previous purchases or shoppers who abandoned cart. There are some audiences that Google will capture and build automatically such as “All visitors.” You can access these anytime and use them to your heart’s content. Using a Display type campaign in Google Ads you can target previous visitors and deliver ads to them on other websites across the internet that allow for display. This uses information from your feed in Merchant Center and builds ads tailored to what shoppers had previously viewed in your store. Dynamic Remarketing is best-suited for those with the available ad budget to invest in display-style ads. This is the preferred type of remarketing used in Google Shopping. It is very easy to use because it is not an actual campaign. Instead, merchants and advertisers can “attach” audiences they build using Google Ads or Google Analytics to their campaigns. When a previous store visitor searches on Google again, Shopping ads are re-delivered to them based on what they had previously viewed or purchased before. RLSA is highly customizable based on the audiences you build. You can keep it simple by targeting “All visitors” or build specialty audiences based on site usage data like Bounce Rate. There are a few specialty programs that can be enabled within your Merchant Center account. Though some are not applicable to all merchants, knowing about them and how they can impact your Shopping campaigns is important. Do note that Google is always looking to improve their offering to merchants and they release new stuff every year including Beta programs. Stay on top of releases by following Google Ads or subscribing to the Google Ads blog. Essentially a way for merchants to add coupon codes to Shopping Ads, Merchant Promotions is one of the oldest programs still available in Google Shopping. Used to add promotional messaging to Shopping Ads indicated by the text “Special Offer” within a product ad. When shoppers click on the Special Offer they will be provided a coupon code to then use when checking out. Requires that you complete an interest form before being approved for use and follow unique guidelines set forth by Google. Another one of the legacy programs that’s been around for quite a while, use of Product Ratings also happens to require that you first submit an interest form and follows its own set of guidelines. Product Ratings add the 1-5 Star Ratings you may have seen in Google Shopping ads before. These product reviews can be collected and submitted in a few different ways, but the most common method is by going through an approved 3rd party review aggregator. Only for merchants with physical store locations, Local Inventory Ads showcases local availability of your products right in Shopping ads. For example, a nearby shopper may see your ad and it will also show the distance to the nearest store with inventory of the product. Can be enabled directly in Merchant Center, but follows its own set of specific requirements and guidelines. Released in April of 2017, Google Customer Reviews replaced another program at Google called Trusted Stores. It is a free program allowing merchants to collect valuable customer feedback when people finalize a purchase. There is a lot to Customer Reviews which also follows its own set of guidelines. Here’s a helpful guide to get you started. Google Shopping represents, by far, one of the most potentially lucrative digital marketing channels for today’s ecommerce merchants. Shopping ads have proven, year-over-year, to be a major asset for merchants looking to acquire both new and returning customers. The traffic stemming from Google Shopping ads is not only extremely targeted, but it is also incredibly cost-effective. In a study published back in 2017, we analyzed and compared tens of thousands of Shopping campaigns against traditional text ads. We found that Shopping campaigns drove, on average, 45% higher revenue gains than text ads, and at an 8 times (X) higher ROAS. My hope is that, with the help of this guide, you’ll be able to take on Google Shopping with more confidence. Don’t hesitate. Get started today! Anthony Capetola is the Marketing Manager for Sales & Orders, Management Software for Google Shopping, Premier Google Partner, Google CSS Partner, and Elite BigCommerce Partner. He manages the entirety of paid search and inbound marketing efforts for the company and also heads up the in-house, dedicated BigCommerce app team at S&O in his role as Senior Support Adviser for Google Shopping by Sales & Orders and Facebook Ads by Sales & Orders. A veteran of the digital marketing industry, Anthony started out as a content developer/ghostwriter and has since gone on to build and manage successful SEM and Social PPC campaigns for hundreds of small to large-sized businesses in various industry verticals including national franchises and ecommerce stores. Get actionable insights from our webinar with Google and Sales & Orders.